DNF just shy of 30%. Will not rate because I'm not sure if my expectations screwed with my ability to enjoy the book. I was curious to see if my issues with KA were strictly contemporary-related, but I realized that it's not going to matter what genre she writes - I just can't seem to enjoy enough about the story or characters to justify the problems which stick out. I'm not sure why I was expecting more of a high fantasy offering (maybe it was the repeated comparisons of the main characters to Khal Drogo and Daenerys Targaryen -Song of Ice and Fire this is not). Instead, The Golden Dynasty reminded me of the caveman book I'd recently read with its simplistic language and repeating sounds. So maybe the book was on the more basic end of fantasy. I could probably try to overlook it, right? Holy freaking moly...my husband was hot! ...I was pretty much done for. I might have chalked the book up to being its own category and not a book trying to be high fantasy, if there hadn't been scenes in the book which were trying to be high fantasy. That kind of screws up the message. Comparison number 1 : It is possible for a romance book to incorporate elements of high fantasy and do it well. I can easily offer up Lord of the Fading Lands, which is definitely more of a romance book than a straightforward fantasy, yet the author manages to incorporate a strong language, lush world details, and well-drawn racial characteristics to serve as a fantasy background. The Golden Dynasty - "Kay me ahnoo!" I snapped into his neck. "Rayloo, kah fauna," Lahn murmured. 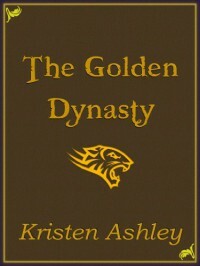 The base for the language in Golden Dynasty sounded childlike and primitive. One could argue that in Game of Thrones, there was a distinct difference between the Khal's people and the other kingdoms - perhaps what could be seen as a more primitive way of communicating - and that was high fantasy. I'd argue that George RR Martin also knows how to pull it off better. Comparison number 2 : It is possible for a romance book to incorporate the idea of sending a woman from our world to live in another world and not sacrifice on the creativity. Wicked as They Come tackled a similar idea (albeit more as a whimisical paranormal) and managed to do it with more flair.